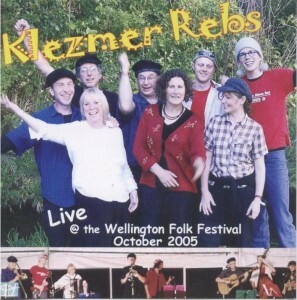 Klezmer Rebs are a 7 piece Wellington band formed in 2002 that plays (mostly) klezmer music, an engaging style of world/folk music born out of the Yiddish/Jewish culture of eastern Europe in the 1800s and 1900s. Klezmer then went to America and in the early 1900s began to fuse with jazz and swing. There has been a worldwide revival of klezmer music since the 1980s. 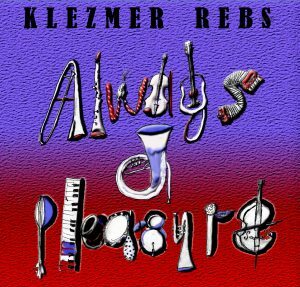 Klezmer Rebs instrumentation includes guitar, mandolin, clarinet, accordion, keyboards, trombone, helicon (like a tuba), string bass and vocals. 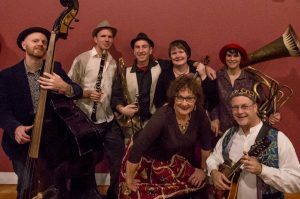 Together the Klezmer Rebs capture the true klezmer spirit with songs of joy, sorrow and rebellion. Gig history The Klezmer Rebs have been shaking ‘tuchases’ (Yiddish for ‘bums’) in Wellington and places north and south since 2002. Over the years crowds danced to klezmer music in Palmerston North, Greytown, Whanganui, New Plymouth, Nelson, Golden Bay, Christchurch, Dunedin and across the Wellington city and region. Recently the Rebs performed at the Acoustic Routes (Wellington Folk Club) Whanganui Festival of Cultures and Whanganui Jazz Club, the Dunedin Settlers Museum, twice at the Lower Hutt Dowse Art Gallery (Late Lounge), at Café Meow and at Old St Paul’s in Wellington. The Klezmer Rebs paired up in Wellington on tours by the Jews Brothers (Auckland), London Klezmer Quartet, Klezmeritis and Gypsy Nights (Melbourne). The Rebs will be performing at the 2018 Auckland Folk Festival. In February 2010 the Rebs where honoured to perform for dignitaries at the opening of the Anne Frank Exhibition at Te Papa. Other appearances included the 2008 Parihaka Festival, the New Plymouth Festival of Lights in 2008 & 2010, the Festival of the Elements in Porirua (2005, 2006 & 2009), the Wellington Folk Festival (October 2005 & 2007), at the Te Papa for the World Music Festival (2006) and the 2006 & 2008 Wellington Fringe Festival. In 2009 The Rebs wowed a huge crowd at the Wellington City Council’s Magic Gardens (Botanic Gardens Soundshell), and played at the Organic River Festival in Levin, Waitangi Park on Waitangi day. Repeat offenders, the Klezmer Rebs played at the Newtown Festival in 2007, 2008, 2012, 2014, 2015 and 2017 plus they headlined on the main stage in 2011. The Rebs have twice performed on Radio NZ National Programme’s Friday Live with Jim Mora. In 2016 the Rebs played gigs with the Jews Brothers (Auckland) and the London Klezmer Quartet. Live Hearing Klezmer Rebs live expect big band and vocal arrangements of genuine old klezmer tunes – from the lively genuine Yiddish wedding music (freylachs and bulgars) to the delicate slice of life stories from the east European shtetl (ghettos). The Rebs world music appeals to everyone. 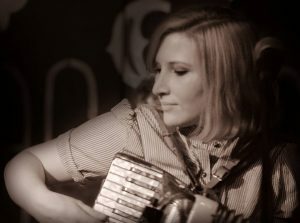 While many of songs are sung in Yiddish (that mostly-Germanic and very onomatopoeic language), they also perform partisan songs from Italy, Russian folk tunes, French chansons, Latin cowboy love songs, Argentine Yiddish Tangos and 1940s swing vocal songs. Their own quirky, politically charged multi-lingual originals are some of the most popular crowd tunes. The Rebs are a performance band – full of story songs and interaction with the audience. The songs are portrayed dramatically as well as aurally. New CD Always a Pleasure features a sophisticated mix of traditional klezmer dance tunes, Ladino culture story-songs, classic covers and classy original tunes. 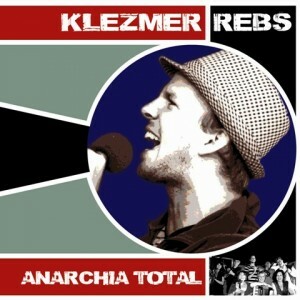 The Klezmer Rebs released the CD Anarchia Total on Ode Records. Recorded live (mostly), the Anarchia Total CD the original title song by clarinettist Urs Signer, classic klezmer tunes, some unconventional klezmer (a Yiddish tango and a klezmer western swing song Blue Klezmer Moon) plus a rude Russian song, the classic Minnie the Moocher, and a remix by NZ DJ Cut Loose. Just add Shmaltz is a 14 track, 50 minute studio CD recorded in 2008. It features an original kiwi-klezmer tune, traditional klezmer songs, and the odd French, Russian and even Latin songs. So enjoy it already! The Reb’s 2nd CD, Live at the Wellington Folk Festival 2005 captures the Rebs in full flight. 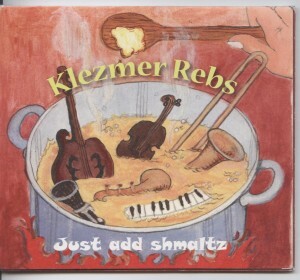 CDs are available through the Klezmer Rebs website http://klezmer.co.nz/cd-order/ and on-line through their Bandcamp site http://klezmer.bandcamp.com/. The Rebs also contributed original tracks to local compilations Wellington World Music Compilation CD, and features on Monkey Record’s compilation Gypsy Fever.